Welcome back! I hope you enjoyed your holiday weekend and had some downtime. I know my family did…it was so beautiful out and we just relaxed and played outside all weekend long. Some much needed family time! Now it is time to get back to the grind! Today, we are tackling our spices. 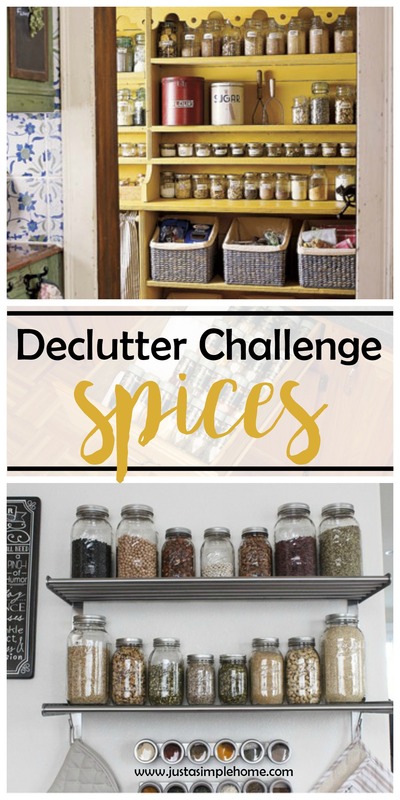 You may have your spices in a kitchen cabinet, on a rack, in a drawer, or something else completely. Today we are going to dust them off and go through them to clear some space. Take everything out of your spice cabinet so you can see what you have. Go through your spices and get rid of those spices that you never use, but are just sitting there. As a general rule, whole spices will stay fresh for about 4 years, ground spices for about 2 to 3 years and dried herbs for 1 to 3 years. Store spices in a cool, dark cupboard, away from direct heat or sunlight; keep tightly closed when not in use. Combine duplicate spices- do you have a few half empty jars of basil? Combine them and get rid of the empty containers. Think about how you want to store your spices…do you want to take time to label them? Do you need to go buy a shelf so you can see what you have at a glance? What will make your life easier? Once you have decided what you are keeping (and tossed the rest), clean off the containers so they aren’t all sticky and dusty. Be sure to also wipe down your cabinet before putting them back. This is a quick task for you today, but it is one more small thing that will make a difference in your life. Are you ready to keep going? Grab your free printable to follow along all month! Great idea!! I usually move every couple years and when I do, I use that as a time to clear out my spice cabinet which is nice because it never really gets out of control! Oh my goodness! I LOVE this post! I have a draw over stuffed with spices desperately in need of organisation. I think I also have some that are about 6 years old!! Thank you Rebecca! I think it may be time to get rid of some of those spices, lol. They can’t taste that great! I hope it helps! I accidentally decluttered my spices one time. We were moving and I completely forgot to pack them! Needless to say, all of my spices are less than a year old and I obviously use them! haha! Before that happened, I tried to go through my spices twice a year to be sure I had what I needed and discarded what was old or no longer useful. This is perfect! I try to keep my spices up to date but I need to go through them again I think.